I admit when I left for the Peace Corps, my goal was to essentially sneak out of the country under cover of darkness. When my roommates and my family asked about throwing me going-away parties I asked they be small in order to minimize the number of goodbyes. When you leave for the Peace Corps, there’s a tendency for people to treat you like you’re dying, and I wanted to avoid that. So I didn’t tell most of my friends I was leaving for Samoa until I was at LAX getting ready to board my flight. I have a feeling leaving Samoa won’t be so easy. Fa’amavae, or going-away parties, are a big deal in Samoa. 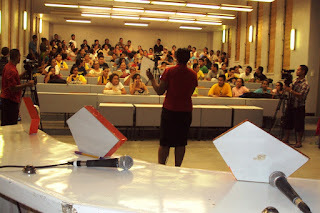 My group’s first Samoan fa’amavae came near the end of training when we left the training village. 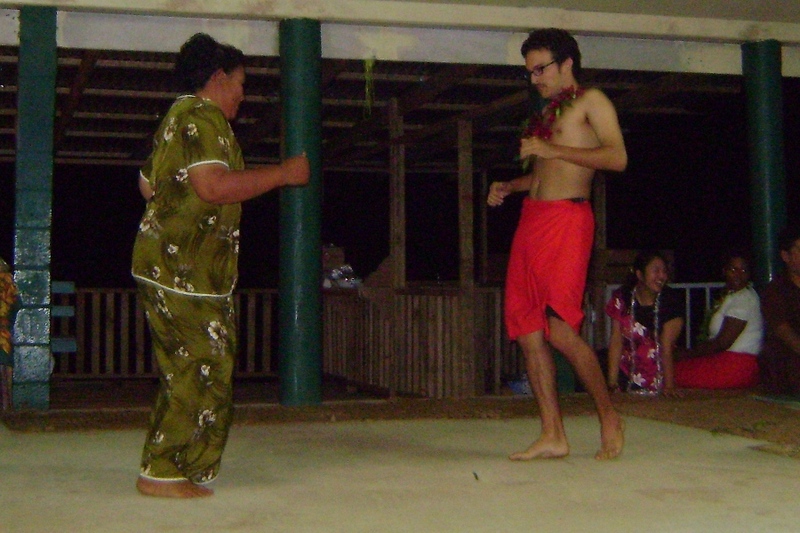 We spent a good 5 or 6 weeks preparing for the event, including rehearsing a song, a play, and several Samoan dances. The party took on a fiafia structure, starting with a big dinner and eventually evolving into an exchange of talents and musical numbers. Most volunteers went home after the public event for private celebrations with their host families, which probably included an exchange of gifts and even more food. Now that group 81 is getting ready to leave our permanent sites where we’ve lived for considerably longer, the stakes are a lot higher, and some of us are starting to get nervous. Much of Samoan culture is considerably more formal than American culture, and I personally feel like I’m constantly walking on eggshells, hoping not to say the wrong thing or inadvertently slight anyone—and that’s just normal life. 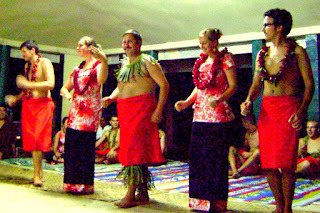 Just like in America, special events in Samoa—weddings, funerals, Christmas, going away parties—bring on heightened stress. Most Samoan speeches begin with an apology. “I’m deeply sorry if any of my past actions have in any way offended you...” Et cetera. I guess I can handle that. Maybe throw in some biblical allusions for good measure. Round it off with a long list of thank yous. I guess I can do that. Maybe I’m more worried about the exchange of gifts. It’s somewhat common for a school to give a departing Peace Corps Volunteer money, which is nice, but it definitely puts the pressure on the volunteer to reciprocate, and it’s difficult to know what’s appropriate. Giving money back? Not appropriate. For host families, several Peace Corps staff have suggested framed pictures, or some sort of photo album. I feel like the magazine I created for my school might be enough of a gift, but I don’t know how fresh that will be 2 months down the line. In any case, volunteers often throw our own fa’amavaes where we get together for one last hurrah. Group 81’s shouldn’t disappoint. And then, of course, there’s the typical congregating at Aggie Grey’s—from where the airport shuttle departs—for hugs and a final Vailima. I’m dreading / looking forward to that. Back to regular blog programming tomorrow. 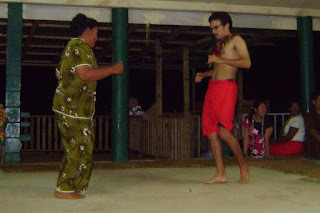 Me dancing at our host village fa'amavae. 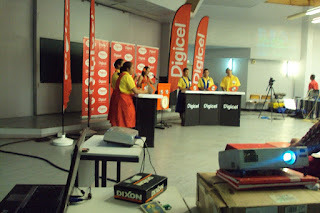 The Battle of the Minds finals I scrutineered on Saturday morning. The Battle of the Minds studio audience during a brief break when Digicel did a promotion.